Obesity makes influenza more dangerous. But it may also give us clues about how to stop potentially fatal flu earlier. Is this really gonna make sure I don’t get the flu? I wonder each fall when I go to get my flu shot. Then I give a small sample of my blood in a study to help find the answer. The 2014–2015 flu season has been a tough one, says UNC’s Melinda Beck, who studies the relationship between nutrition and immunology. When people get the flu despite being vaccinated, a lot of the reason why is because viruses mutate quickly. We can’t control the flu’s super-fast evolution. But Beck’s lab found evidence that we can control how well our bodies make use of the vaccine—by controlling our weight. At UNC’s Family Medicine Center, when patients like me come in for a flu shot, Beck’s study coordinator asks us to participate in a study and give two blood samples. The first one she takes before sending me off to get a flu shot. Then, 30 days after receiving the vaccine, I come back to the lab for a second draw. At this stage—30 days out—blood from normal-weight people and obese people looks about the same, Beck says. Our antibodies all respond to the inactivated flu virus in the vaccine, preparing to fight it off if it turns up again in live form. But the following year, when I come in for my next flu shot, the lab draws my blood one more time. This is when the differences really show up. Beck’s grad student Justin Milner and the lab found that people with a normal body-mass index still have antibodies against the previous year’s flu. Not enough to provide good protection for the next flu season, but some antibodies are there. But in people with obesity, those antibodies have dropped way off, Beck says. 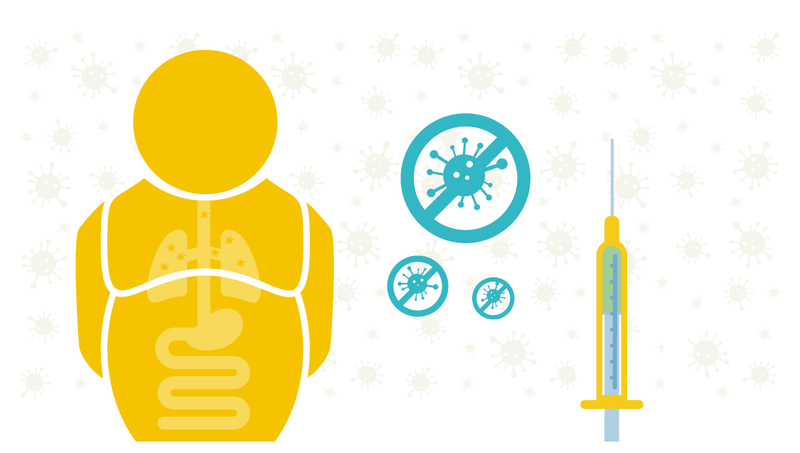 Overall, people who got the flu vaccine in 2014 lowered their chances of getting influenza by only about 23 percent [http://www.cdc.gov/media/releases/2015/p0115-flu-vaccination.html]. That number might turn out to be even lower for people who are obese, according to research from Beck’s lab. If the virus makes it past the antibodies, the body has another line of defense. T cells kill any cells in your body that the virus infects. The flu vaccine primes these T cells to recognize flu and fight when it appears. But when you’re obese, there are problems with your T cells too, Beck says. Back in the 2009 H1N1 pandemic, researchers noticed that obese people were more likely than normal-weight people to die—not just from H1N1, but from any kind of flu. Most people survive even severe flu, as long as they get medical care. But most of us don’t head for the hospital as soon as we start feeling sick. What if you could tell early on whether your flu warrants a hospital visit? Milner found that just 24 hours after infection with flu, T cells from obese mice react differently than T cells from normal-weight mice. This leads Beck to imagine a drugstore test, like a home pregnancy test, that you could take as soon as you suspect you have flu. The test might measure certain activity of your T cells and advise you to go to the emergency department if your T cells don’t seem to be working right. First her lab has to nail down what’s going on with T cells in obesity. “When T cells are resting and floating around your body, they use fatty acids as a fuel source. When you’re revving up to fight infection, they use glucose as fuel,” Beck explains. One of her theories is that obesity messes with immune cells’ ability to make the switch from running on fatty acids to glucose. As the number of people with obesity increases, we need to know a lot more about obesity and the immune system, Beck says. It’s not just about the flu—she expects a wave of new research showing that as we get larger, we’re making it harder for our immune systems to fight off all kind of disease. Melinda Beck is the associate department chair of the Department of Nutrition at the UNC Gillings School of Global Public Health. Justin Milner is now a postdoc at the University of California, San Diego. His research won a 2015 Graduate Education Advancement Board Impact Award for valuable discoveries of direct benefit to North Carolina.